Originally published March 5, 2018. I recently spent an afternoon with one of my dear girlfriends. She's a loving wife, a devoted mother, and, from my point of view, does a great job of running a thriving household while still working part-time in a creative field she enjoys. So it was surprising to me, on our way to lunch that day, when she expressed anxiety over a video recently posted on Facebook by another mom in town. In the FB video, the other mom shares her success at getting her little kid to eat broccoli. Now, I'm a big fan of broccoli and believe in the power of this cruciferous vegetable, but I am not a parent and may not appreciate how big a deal it is for kids to eat it. Apparently, it's a bigger deal than I thought because even though my girlfriend has posted tons of child-centered informative content on her own social media, this "broccoli post" was upsetting because she thought it more impactful than anything she'd ever done. That's when she began to spiral down the rabbit hole of self-doubt. It's human nature to compare ourselves to others. We all do it - we all think we're good at something until we size ourselves up against someone else who seems to be prettier, smarter, more fit, a better parent, a more successful business person, etc. Author Steve Furtick says social media is now the reason why we struggle with insecurity so much - we compare our "behind the scenes" to everyone else's "highlight reel" and then suffer a crisis in confidence. But, Theodore Roosevelt said it best; "Comparison is the thief of joy." Apples don't compare themselves to oranges. A rose doesn't think of competing with the daisy next to it. It just blooms. The stars in the sky don't compete with other stars - they know there's room for all to shine in the ever-expanding Universe. 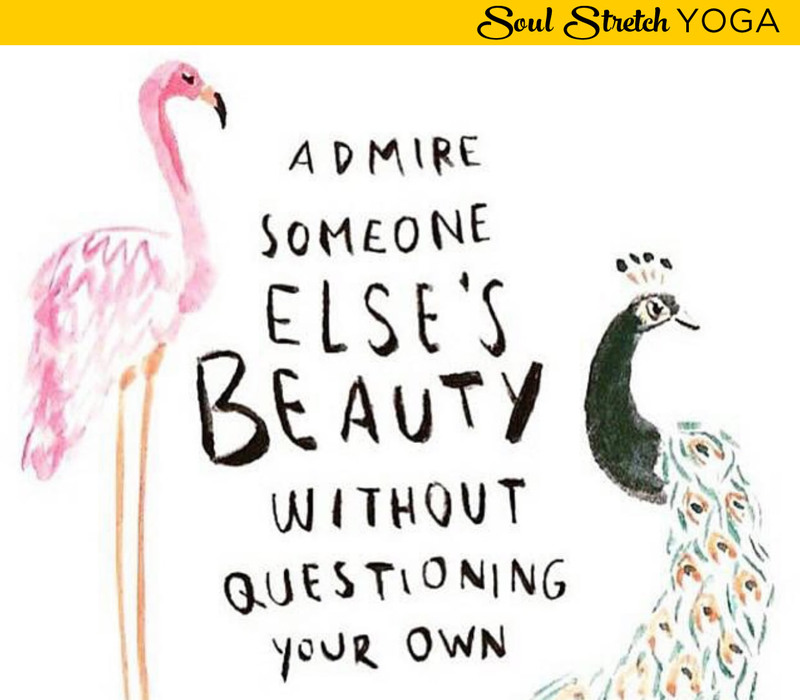 Before yoga, I was continuously comparing myself to others. My jealous energy was stealing my self-love and making me more competitive and less community oriented. I was also imposing unrealistic, unhealthy expectations on myself and my household. Fortunately, those first few years on a yoga mat taught me to embrace who I was while feeling confident enough to celebrate the uniqueness of others. It was during my YTT (Yoga Teacher Training), in 2014 that I was gifted "Angels of Abundance" by Doreen Virtue, a lovely little book broken down into 11 effective messages on how to develop a new mindset on comparison. In Message 4, Virtue writes; "No one is going to beat you to your life purpose, because no one but you can fulfill it. There's no race, and no competition. God doesn't play favorites. You have a much love and support as everyone else. Promise!" So how do we stop comparing ourselves to others? With GRATITUDE. After all, it's harder to begrudge the blessings and beauty in another's life while also considering the hardships that he/she has faced. Gratitude helps us reach our fullest expression of our true selves while championing others when they do the same. Life's hard enough. Breathe. Stop comparing yourself to others and learn to live your own amazing life.